- which is the first one of a new generation, caring about sustainability and connecting with the community (hence why they chose a local artist)" Hartwig Braun, artist. The blue & yellow monochromatic colour-way version of the commissioned piece has been presented as a special gift to all VIP attendees to the stakeholders dinner on 31st January whilst 600 people who helped to make the building a reality received the full coloured version on the opening day on 7th February. Adding to their community ethos, everyone who has helped launch the new IKEA was given a framed print of the artwork - each one signed personally by Hartwig. Working closely with the store manager and IKEA's PR & Communications team - as well as staff at the new store - we have had a very enjoyable experience!! 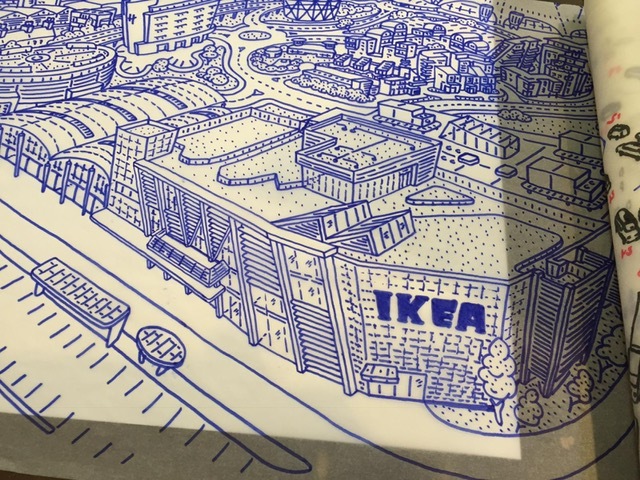 “To celebrate the opening of our leading sustainable store in Greenwich, we wanted to create a memento which demonstrated that IKEA was committed to being a good neighbour in the local community and an integral part of the city landscape. One of the Greenwich co-workers came across Hartwig’s work at Greenwich Market and we instantly fell in love with his unique style and use of colour. It’s been an absolute pleasure to work with Hartwig and we’re delighted with the illustration that he created.” Helen Aylett, Store Manager at IKEA Greenwich. Sit back, relax, get comfy. But you'll need something comfortable behind you, so let us introduce our NEW cushion covers! Yes we have had cushion covers before, but these are printed to order in the UK and we have colour matched them to give the best finished look, akin to Hartwig's large art prints & canvases. We are excited to bring you new products and more designs than ever before available, on cushion covers! Printed all over, on both sides, you can not miss the artwork on these. Two sizes available; 45cm and 60cm squared, you can even layer cushions on the sofa, or bed, to create a premium and arty display! For example why not have a 60cm cushion behind a 45cm cushion of the same - or differing - design! What's more, some designs are available as a triptych - a panorama across 3 cushions, allowing you to spread a design across your sofa. As you can see from the photo below, you can have London, Berlin or Sydney as a triptych. See the range at this link here: Cushion Covers. Once all the cushions are in place, you can get on with the nation's favourite past time - looking at your Smartphone, calling someone, taking selfies, catching up on social media. But no smartphone is complete without a piece of artwork on the case. So let us introduce the many designs, colours and cases available with Hartwig's hand-drawn artwork on them. Have a look through which cities are available and choose your favourite. The web shop shows some examples of the different cases, however, you will see from the drop down menu there are a few different Apple & Samsung phones we can cover. Whether it's of your home city, or to remember somewhere you have visited, having one of our phone cases in your hand is a nice way of owning a piece of art. These two examples show a colourful London and a blue New York City. Hartwig has taken everything into consideration when choosing which designs and crops because of the shape of each case and positioning of lens/flash hole, but keeping the artwork still legible. See for youself at this link here: Smartphone Covers. With plenty to keep Hartwig Braun occupied lately, this also means his website and social media has been in need of a revival. So this spring has seen a steady stream of uploads, that we thought could do with your attention. While Hartwig focusses on the intricate line drawings - currently 'Berlin Looking South' - he will update his Instagram account for an exclusive look "From The Drawing Board." Mixed in with these are updates from Hartwig of what he is upto, or where he is. For example, his most recent trip away - a long weekend in Paris - was captured in a few snaps. It gives you an insight into how Hartwig works, from one step to the next. Sharing with you little tricks and unique ways to make his artwork. As well as seeing the Metropolis through his eyes. F urthermore, at each stage of his drawings, he may update his website with a blog post. As you can see from the recent blogs, spanning his time working on the drawing stage of 'Berlin Looking South.' These blogs give you an insight from the artist himself, as to how he tackles each stage of the drawing process and how he moves onto the next part. Keep an eye on his blog for the next stage of drawing - colouring in! A blog is a great way to condense loads of information with visuals and all in his own words. Keep an eye on the Blog page of Hartwig's website, as no doubt there will be more on his latest Berlin drawing and all future commissions and drawings Hartwig finds himself working on. London Looking West canvas has gone - as you can see from this photo - and is replaced (in the ground floor shop space) by a beautiful blue large art print, signed and framed by Hartwig; 'London Looking West Special Edition Blue & White'. It's nice to have a large framed art print here on the shop floor, as there has always been a canvas hanging in this space before. With a white border and black frame, the new art print hangs proudly for all to see. Other sizes available; 60 x 25cm prints will be available - larger ones are printed and framed to order. Our downstairs gallery space, is changing too; with an all new edition of London Looking West. With a Limited Editon of 150 copies, we present 'London Looking West in Black and White.' A large art print, signed and framed. Each Limited Edition print comes with your very own Certificate of Authenticity and numbered edition - also signed by Hartwig Braun, the artist. Different from the Line Drawing version - this black and white edition is predominantly black and the lines are white. It really draws you in - see for yourself! So something new to see when you visit us in Greenwich Market. Artist Hartwig is usually around on weekends if you would like to meet him too - he loves to talk about his process and the finished artwork! Or leave a note in our exhibition guestbook for him to read later. With Ravenburger's puzzle expertise, Hartwig's artistic license and Isaac's business know how, a collaboration has formed and we'll be excited to share the new puzzle with you soon! "Cartoon Earth" a translated version of 'Our Wonderful Planet' - for the mass market that Ravensburger have access to - you'll see the much loved artwork by Hartwig, bigger and in more pieces! Fun for all the family. This new 1,500 piece puzzle will have a completed size of 84 x 59cm - larger than our existing 1,000 piece jigsaw puzzle of the same design. So we hope you have a large board to lay all the pieces onto! Through working with Ravensburger, the jigsaw puzzle will be stocked on Amazon, Jigsaw Puzzle Direct and Tesco initially, and also from us! You'll be first to know when they are in stock! Ravensburger are a well known manufacturer of jigsaws; based in Germany - no relation to Hartwig also being German! Launching their first game in 1884 "A Trip Around the World"; you could say they have something of a love for the globe and Hartwig's artwork of 'Our Wonderful Planet' works so well with them. Last year Ravensburger acquired US based company 'ThinkFun.' Ravensburger also have their own interactive museum and theme park! You will know by now we have Hartwig's hand drawn artwork available as large art prints & canvases - if you don't, where have you been? Viewable online and in our gallery in Greenwich Market! Well, with many different cities and illustrations by Hartwig, in different colours and size options, we thought it would be beneficial to highlight a few, incase you're considering an order & need help picking the right one! Sizes. Canvases sound like they take up a lot of wall space - and they can - but we have some options to fill those small areas of the office or home; like nicely above the fireplace for example. Our smallest canvas 60 x 45cm - the smallest panoramic canvases are 100 x 43cm. These are ideal for a small home or office! The 'Our Wonderful Planet' or 'Jolly Britain' small canvas is great for a child's bedroom! For a larger home - or that one large wall you have empty - or the office boardroom/reception area, our canvases can go up to an impressive 195 x 82cm. Almost 2 metres of hand drawn details of London/Greenwich or whichever artwork you go for. So keen to order? You can do so via our website, or in person in the gallery/shop in Greenwich Market, We are open everyday. Please allow 7-10 working days for canvases, this includes the printing and mounting, plus getting Hartwig to sign each one. If it's for Christmas, please do let us know so we can try to get it done quicker if need be. Also, if it is for Christmas and you are collecting we will hold the canvas in the studio until you are ready to collect (Christmas Eve for example) Otherwise, delivery is included in the price - in the UK - and we send everything first class recorded with our courier! If it is easier for you (if travelling) the canvases are available to order unmounted and will be sent rolled in a tube. It is that time again! It always creeps up slowly and then bam! It's Christmas! With the Greenwich Market lights & decorations in place, adding a warm glow to the area and our own window display done, we are officially ready for Christmas and the shopping days that lead up to the big day! Throughout Advent, we are sharing reminders of Arty Globe products - that we think will make fabulous gifts for someone this Christmas. Each comes with an idea for who that person could be - for example, hardback notebooks for your child's teather, a framed print of London/Greenwich for your parents, or our Wentworth Wooden Puzzles, something all the family can enjoy over Christmas. Look out for our specially prepared snowy product shots each day on Facebook, Twitter and Instagram! Hartwig has been creative with his Snowy green version of his hand drawn artwork; 'Greenwich to Canary Wharf.' Hartwig has made bauble decorations for our windows - cutting out circles of different parts of his artwork. Have you seen them yet? Send us a photo of your favourite window pane (tagging us @artyglobe on Twitter or Instagram!) They're an effective way to brighten the windows for the festive season! Furthermore, a special event this year, to shop at quieter times... With Greenwich Market's Late Night Wednesdays! Through December - starting tomorrow, 6th - Greenwich Market is staying open late! With shops, stalls, food & drink and festive music flowing through the air staying late for shopping oppurtunities after work in the evening - and even better news; you do not have to pay to enter; like other Christmas markets & winter festivals - you are all welcome to browse and soak up the atmosphere while you wander round. But it is an ideal time to pop down and get some Christmas gifts when it's quieter and avoid the Market at weekends when it is busiest! Keep an eye out for our Advent Christmas gift guide to get some ideas! We hope to see you over the Christmas holidays and before. If we don't then we wish you a very Happy Christmas and wonderful New Year, from all of us at Arty Globe! Monday 20th November, 2017. A very special day for an event held at RIBA (Royal Institute of British Architecture) Marylebone, London. In collaboration with charity Article 25's 10x10 London event. Article 25 is a charity concerned with providing the skills and knowledge needed to make safe and appropriate building projects possible. Their vision is of a world where all people have access to dignified shelter and housing, adequate and safe school buildings and effective clinics and hospitals. As you can see from the photos above, Hartwig was proud to have his London Looking West Line Drawing, specially prepared for the Charity Auction on display. There was time to mingle - with a glass of wine - with the other attendees involved in the exhibition and charity auction - from the world of art, culture, architecture, design & property; including Antony Gormley, Angela Brady, Fred Pilbrow and David Adjaye. It was also refreshing to meet & see other artists' work and the different styles people have. A further proud moment came when out of the 100 exhibition pieces, only 25 were selected for auction, by the auctioneer, formerly of Sotheby's, Adrian Biddell. The excitement of the auction was also captured - by Isaac - on video. You can see here, how the anticipation builds up and the total works it's way to the flattering amount of £3,200. This final amount was in the top 3 sellers on the night, which raised - with donations & sponsorship - a staggering £105,850. We were flattered to contribute to such a great cause and have Hartwig's 'London Looking West' Line Drawing so well received. opportunity to participate in such a prestigious event." London Looking West Line Drawing is available from our website and in our Greenwich Market gallery shop. Along with other designs and limited edition colour option. There are also canvas versions and a special Festive London edition. Social media is a huge part of daily life - and it is not just personal pages; each business, big or small needs to have a presence on the popular social media channels. Our most used page is Facebook, where you can us at: https://www.facebook.com/ArtyGlobebyHB/ for all links, updates and images shared. The Arty Globe Facebook page is linked to our Twitter account too - although we do sometimes tweet about other things concerning us, the local area (Greenwich, London) and other things of interest or humourous! You can find us on Twitter @artyglobe. Also, artist Hartwig has his own Twitter account if you want to follow updates from the drawing board... @hartwigbraun ! Similarly, on Instagram you can follow both Arty Globe and Hartwig! You'll conveniently find us with the same usernames: @artyglobe and @hartwigbraun ! To intrigue you even more, sometimes we hold social media competitions so keep an eye out for your chance to win some cool prizes! We are also contactable via our social media, so do share anything with us you think we would like - incuding any photos of Hartwig's art or gifts in your home!